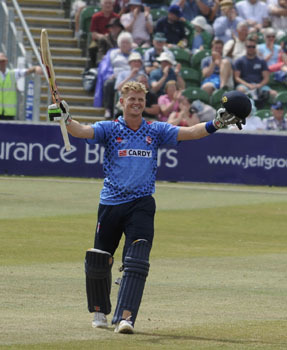 Kent’s Sam Billings and Middlesex’s Dan Christian were joint-winners of the Walter Lawrence Trophy in 2014, with both men having scored 46-ball centuries. Billings, a product of Loughborough MCCU, made his dashing hundred in the Royal London One-Day Cup match against Somerset at Taunton on July 31. Coming in at number seven the 23-year-old Pembury-born wicket-keeper, who has been voted Kent’s Player of the Year for this season, spanked 12 fours and 4 sixes in his century, going on to finish unbeaten on 135, made off 58 balls.